NEW YORK, N.Y. -- New York Attorney General Barbara D. Underwood and Governor Andrew M. Cuomo today announced a suit against the Trump administration to block its efforts to punish so-called "sanctuary" jurisdictions by putting immigration-related conditions on federal law enforcement grants. In the suit filed in the United States District Court for the Southern District of New York, a coalition of six Attorneys General led by Attorney General Underwood argue that the Trump administration's conditions on the grants interfere with the right of states and localities to set their own law enforcement policies, and that the Department of Justice lacks the authority to impose these new conditions. "Local law enforcement has the right to decide how to meet their local public safety needs – and the Trump administration simply does not have the right to require state and local police to act as federal immigration agents," said Attorney General Underwood. "Instead of allowing New York's law enforcement agencies to determine how best to keep New Yorkers safe, the Trump administration is threatening to withhold vital public safety funds. This is a political attack on New Yorkers, at the expense of our public safety – and it is unlawful. So we will see the Trump administration in court." Click here for video of Attorney General Underwood discussing the suit. As a result of the Trump administration's actions, New York State alone could lose nearly $9 million in Edward Byrne Memorial Justice Assistance Grant (Byrne JAG) funds for Fiscal Year 2017; the six states that sued today could lose a total of nearly $25 million. In July 2017, DOJ announced that it was imposing new immigration-related conditions on recipients of Byrne JAG funding, and threatened to withhold funds from jurisdictions that did not comply with these conditions. In June 2018, DOJ sent notice to New York State that it must participate in enforcing the federal government's draconian civil immigration policies in order to receive Byrne JAG funding. The conditions would require state and local governments to provide the Department of Homeland Security with advance notice of an immigrant's scheduled release date from a correctional facility; grant federal agents access to correctional facilities to question immigrants; and report on and certify state and local compliance with DOJ's new and expansive interpretation of 8 U.S.C. § 1373 — a federal information-sharing law. Federal law permits states and localities to limit their voluntary involvement with enforcing federal immigration policy, and many have done so because they have concluded that fostering a relationship of trust between their law enforcement officials and their immigrant communities will promote public safety. * DOJ's imposition of the new conditions violates separation of powers because DOJ lacks authority to impose the new conditions under the Byrne JAG statute and other federal law. * DOJ's imposition of the new conditions violates the Administrative Procedures Act because it is not in accordance with the law and is arbitrary and capricious. * DOJ's imposition of the information-sharing condition violates the Tenth Amendment because it requires states and localities to comply with DOJ's expansive interpretation of an unconstitutional law, 8 U.S.C. § 1373. 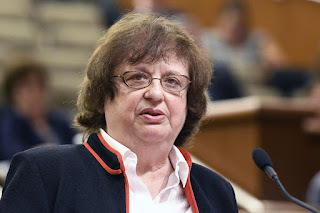 The suit was led by Attorney General Underwood and filed by the Attorneys General of New York, Connecticut, New Jersey, Massachusetts, Virginia, and Washington. The Byrne JAG program is a federal grant program that provides grants to states and localities according to a mandatory statutory formula. Congress designed Byrne JAG to give states and localities a reliable source of law enforcement funding, while also giving them maximum flexibility to decide how to use the funds in accordance with state and local law enforcement policy. DOJ, which administers the grants, is required by law to issue grants in accordance with a mandatory formula set forth in the Byrne JAG statute. Of the total amount appropriated by Congress, fifty percent of the funds are allocated based on each state's population and fifty percent based on each state's crime rate. Each state must receive at least one-quarter of one percent of the funds appropriated by Congress for a given year, regardless of what the formula would otherwise dictate. Between a state and its localities, sixty percent of funding shall be for direct grants to states, and forty percent shall be for grants directly to localities (compared within a state based on crime rate). New York is one of the five states with the largest total allocations, and New York City is one of the five local governments eligible to receive the largest awards. The states involved in today's lawsuit have received law enforcement grants under the Byrne JAG program and its predecessor grants since 1968, and they have used those funds to support a broad array of critical law enforcement programs tailored to local needs, including to support community-based policing, and reduce sexual assault, elder abuse, gun violence, recidivism, and drug addiction. For example, New York has used its Byrne JAG funding to support a multi-county initiative to combat gun violence, to improve criminal records systems, enhance forensic laboratories, support prosecution and defense services, and combat the opioid epidemic. Without Byrne JAG funding, states like New York may be forced to cut funding to these critical state and local programs. Last year, the New York Attorney General's office released legal guidance to support local governments and law enforcement agencies in protecting vulnerable immigrant communities. The Attorney General's office has also filed a number of amicus briefs in other cases related to the Trump administration's conditions on Byrne-JAG funding.